Red and White Mixed Poinsettia Cemetery Cone For U.S. and Canada deliveries only All items featured on this site represent the types of arrangements we offer and may vary depending upon availability in certain regions. Red & White Daises Cemetery Cone. Artificial Flowers. Red Poinsettia Cemetery Cone For U.S. and Canada deliveries only All items featured on this site represent the types of arrangements we offer and may vary depending upon availability in certain regions. A beautifully decorated artificial cemetery wreath for a loved one. For U.S. and Canada deliveries only All items featured on this site represent the types of arrangements we offer and may vary depending upon availability in certain regions. Calla and Roses Cemetery Cone. 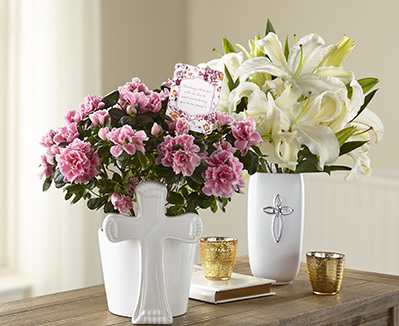 Artificial Flowers For U.S. and Canada deliveries only All items featured on this site represent the types of arrangements we offer and may vary depending upon availability in certain regions. All white white poinsettia cemetery cone. Artificial flowers. For U.S. and Canada deliveries only All items featured on this site represent the types of arrangements we offer and may vary depending upon availability in certain regions.